March 5, 1943 . . . to Texas! Well I’ve finally been shipped out way down here deep in the heart of Texas. We left Tuesday afternoon at 3:30 P.M. and arrived here this morning at 10:00 A.M., with a swell military reception. About 500 boys came down with me, and the shipment was claimed to be the largest out of Ft. Devens. There’s so much to tell that I’ll probably have to wait until after the war to tell you; but I’ll do my best now. To begin with we rode on a Boston and Maine day coach that saw its prime 75 years ago. Nothing but the best for the army, you know. However, the other cars were all more modern and it was better than walking. Leaving Mass., we hit the corner of Vermont, then thru New York, Pennsylvania, Ohio, Indiana, Missouri, Oklahoma, then Texas. I might have missed one or two states, but it doesn’t matter. We hit snow in every state except Texas, which I think is God’s country. (It might be a little of the devil’s too, for it is so hot down here!) We passed under the Appalachian Mts. By way of the Hoosac tunnel, and crossed the Mississippi river. After viewing the country all the way down here, except for Texas, I was thankful that I lived in Massachusetts, for you don’t realize the poverty that most of the people live in. Most all shacks we passed were inhabited by colored people, and a few whites. Yet they seemed to be happy and waved to us as we passed by. Among some of the things of interest we saw were the oil wells of Oklahoma; also the biggest factory I’ve ever seen, later found out to be a Douglas aircraft plant; also oil refineries, brick kilns, miles and miles of flat land, and finally real cactus. Camp Swift is one of the newest army camps in the country and is very nice. It is a camp for specialists and practically everyone is a sergeant or a commissioned officer. We’re the second group in here and pretty near all of us will have stripes (arm stripes) shortly. We were started on our basic training, that is, some of the most important commands. I guess I’ll turn in now and continue tomorrow, March 6, 1943. Here’s my new address. This is permanent, so please write as I am anxious to hear the news from back home. A. Battery, 922 F.A. Btn. I don’t know why I didn’t make the Signal Corps, but I’ll do my best here. The Field Artillery are the boys who man the big guns behind the lines. I will probably be assigned to a gun crew but I’ll have to wait to find out. I just got back from supper, and had some ice water. What a treat that is! I’d give a dollar for a quart of Boston water. Down here it’s awfully flat and you don’t seem to satisfy your thirst. By the way, please send me my Polaroid sun glasses, my ring if you have it, an extra bath towel, and about ten coat hangers. Try and send them as soon as you can. Tell all the fellows my address, and that I’ll write as soon as I get enough to tell about. We’re confined to our barracks for two weeks, because of measles, colds, etc. They do this to every new group in camp. Of course that doesn’t apply to us while we’re training. If there’s any news you’d like to know ask me in your letter and I’ll answer them. I guess I’ll sign off now with love, because I miss you all. I open the first age-stained envelope dated MAR 1, 9 PM, 1943, from Ayer, MASS, Fort Devens STA., with the word “FREE” handwritten in place of a stamp, addressed to Mr. and Mrs. J.J. Bernier, 10 Pond Street, Dorchester, Massachusetts. No zip code needed. Haven’t anything to do this afternoon so I thought I’d write. I’ll begin from the time I left home. Arriving at the Draft Board, I was given charge of the train ticket for the four of us. We left North Station at 8:15 and arrived here at 9:05. An army truck met us at the station and brought us to the receiving office. We were then checked off and sent to a supply depot. There we received raincoats, towels, and toilet-kids. My raincoat would just about fit Frank MacLean and myself. From there we were taken to our barracks and issued bedding. These barracks are two-story, wooden buildings, sleeping about 60 apiece. We have double-decker steel cots, mattresses, two blankets, two sheets, a pillow, pillow-case, and a comforter. It’s very comfortable and I always get a good night’s sleep. We were also given mess kits and over-shoes. After lunch, we were taken to a school-like building and given our I.Q. tests. These consist of three tests, each of 150 questions. The first one is a mechanical aptitude test; the second is a radio telegraphy test; and the third is a General Aptitude test. The marks you receive go with you thru out (sic) your army career and are considered at every advancement you may get. The results are not made known to you, but I think I did fairly well on them. The same night we were marched up to the dispensary and given a vaccination and some kind of a shot. The next morning everybody had stiff arms, from the effects of the shot. This wore off in a couple of days and all were happy. We were given the afternoon off to roam around. The next morning I was bagged for K.P. by a very polite sergeant, who woke me up at 4:40 A.M., while the rest of the crowd I came with was shipped out. Friday was the longest day I ever put in, fourteen and a half hours of hard work. That nite the barracks was full again with fellows from Worcester. Today they all left, and I’m practically alone again. It seems that nothing would stop my father from writing home, not being in a tent, not “forgetting” to bring his pen! 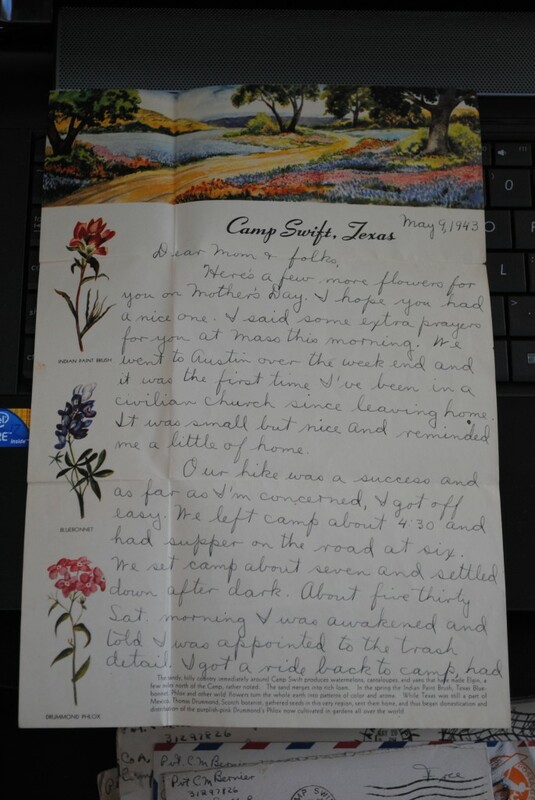 Letters sent home the last half of May, 1943 focus on the drudgery of camp life (and the seemingly endless guard, cleaning, kitchen duties!) and the smaller things, like not being able to buy treats. Despite the drudgery, he always seems to keep his dry sense of humor. K.P., or “Kitchen Patrol/Police,” is the equivalent of being a busser/dish-washer/floor scrubber at a fast-food restaurant…with no chance of earning tips! The thought of a “desperate” cookie situation initially makes me chuckle, but the reality of not having them available because of the war situation makes me feel guilty about what I have in my cupboards right now. “Cupboards”? Does anyone use that term anymore? And frequently there’s the talk of going home . . . Looking for love. I wonder how old is “kind of old.” Cougars? I shudder. For his next letter, he clearly went out of his way to find something special for Mother’s Day. “Here’s a few more flowers for you on Mother’s Day. I hope you had a nice one. I said some extra prayers for you at Mass this morning. We went to Austin over the weekend and it was the first time I’ve been in a civilian church since leaving home. It was small but nice and reminded me a little of home.” Touches of homesickness become a common thread. The frequency of his letter writing–often daily–reminds me of my own daily Facebook time. I, too, feel a longing to be . . . to stay connected with the people who mean the most to me. Fifty-three’ish beautifully handwritten letters uploaded (i.e., typed)! Next steps . . . read through them all, highlight significant statements, events, trends, compile questions for the author!